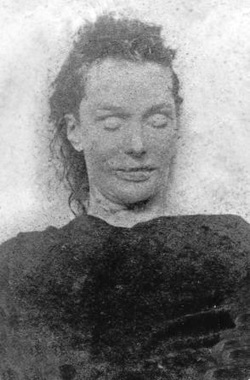 The body of Mary Ann “Polly” Nichols was discovered in the wee morning hours of August 31, 1888, at about 3:40am. her body was found in front of a gated stable entrance in Buck’s Row, Whitechapel. Her throat had been deeply severed in two locations and her lower abdomen partially ripped open by a deep, jagged wound. The killer had also made several other incisions in her abdomen with the same knife. A witness had reported seeing Annie Chapman talking with a man outside 29 Hanbury Street, Spitalfields, 5:30am the morning of her murder. Approximately twenty minutes later, her badly mutilated body was found near a doorway in the back yard. Her throat had been cut much in the same manner as was Mary Ann Nichols’ and her abdomen slashed entirely open. A later autopsy revealed that the killer had removed her uterus. The Ripper would claim two victims in the early morning hours of September 30, 1888; the first of which was Elizabeth Stride. Her body was discovered in Dutfield’s Yard, off Berner Street, at approximately 1am. The killer had cut her throat, severing her left artery, yet no other slashes or incisions had been made. Because of the absence of abdominal mutilations, there has been some doubt as to whether or not Stride was in fact killed by Jack the Ripper. However, most experts agree that Stride was murdered by the same killer due to the nature in which her throat had been cut. It’s also believed that the reason Stride had not been mutilated like the others, was due to an interruption of some sort. It’s possible the killer feared he was in jeopardy of being detected by nearby witnesses, and elected to flee before finishing his ritual. 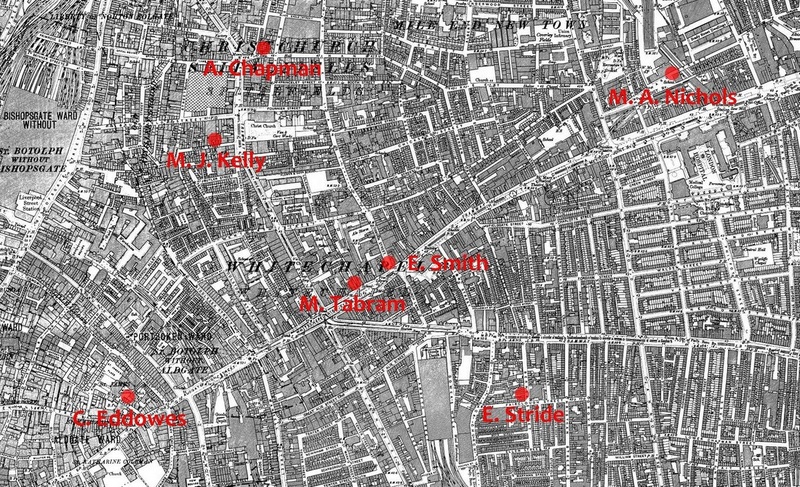 Forty five minutes after Stride’s body was found in Dutfield’s Yard, Eddowes’ body was discovered in Mitre Square, within the City of London. Eddowes’ throat had been severed and her abdomen torn open with a deep, jagged wound. Her left kidney had been removed, along with a major portion of her uterus. The Stride and Eddowes murders were later referred to as the “Double Event”. Considered to be Jack the Ripper’s Swan Song, Mary Jane Kelly’s murder was the most gruesome of all the Whitechapel Murders. She was found horribly mutilated, lying on the bed in her single room flat where she lived at 13 Miller’s Court, off Dorset Street, Spitalfields. She was discovered at 10:45am on the morning of Friday, November 9, 1888. The landlord’s assistant, Thomas Bowyer, had been sent over to collect the rent, which she had been weeks behind in paying. When she didn’t answer his knock at the door, Bowyer reach his hand through a crack in the window, pushing aside a coat being used as makeshift drapery. What he saw at that moment was absolutely horrific. Kelly’s body was mutilated beyond recognition. Her entire abdominal cavity had been emptied out, her breasts cut off, and her viscera had been placed about the room, as if for decoration. Kelly’s face had been hacked away and her heart removed, which was also absent from the crime scene. Kelly’s murder was by far the most grisly and ritualistic of all.